The next-generation astronomical X-ray telescopes, such as IXO, require extremely large collecting area combined with good angular resolution and high area-to-mass ratio in order to achieve unprecedented sensitivities for the study of the high-z Universe and for high-precision spectroscopy of bright X-ray sources. The Flight Mirror Assembly (FMA) provides an effective area of 3 m 2 at 1.25 keV, 0.65 m 2 at 6 keV, and 150 cm 2 at 30 keV. To meet the observatory's 5 arcsec half-power diameter (HPD) requirement, the FMA angular resolution must be 4 arcsec for E < 7 keV and 30 arcsec at 30 keV. Attaining the large effective area within the launch vehicle mass constraint requires a mirror with a high area-to-mass ratio: 20 cm 2/ kg, which is 50 times larger than Chandra and eight times larger than XMM-Newton. The FMA uses the nested grazing incidence mirrors to focus X-ray photons on the detector plane. 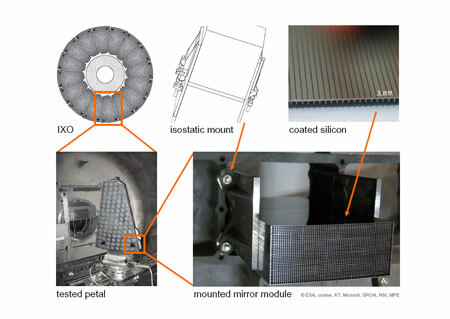 The challenge has been to develop a technique to produce mirrors rapidly with the characteristics to fulfill the IXO angular resolution requirement. A key feature of the IXO mirror design is a single mirror assembly that is optimized to minimize mass while maximizing the collecting area. Two X-ray mirror technology options are in development for IXO: segmented glass (with development led by NASA) and silicon micro-pore optics (with development led by ESA). Both methods are making very good progress, and are described in more detail below, see Segmented Glass Optics and Silicon Pore Optics. With either of these technologies, the IXO mirrors will meet or exceed performance requirements. The segmented glass optics are being developed at the Goddard Space Flight Center (GSFC) mirror development lab. The mirror team has worked over the past decade perfecting a new technique to produce high-quality mirror segments rapidly. The mirror production begins with commercially-available glass and a properly figured and polished mandrel (rounded mold) with the required shape for the final mirror segment. The glass segment is placed on the mandrel and then in an oven. As the oven heats up to about 600° C, the glass softens and sags under its own weight, wrapping itself around the mandrel. 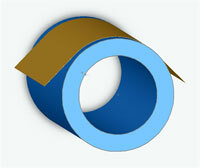 When the glass is removed the resulting segment is a perfect replication of the mandrel's surface. Two recent developments have proven that this glass segmenting technique is ready for prime time. In early 2008, the FMA technology team tested a two-mirror system and achieved an angular resolution of 14.7 arcsec at 8 keV, proving that the requirements of IXO are all but certain to be met by the segmented glass mirror segments. In addition, the GSFC mirror lab has been enlisted to produce the over 3000 mirror segments for the NuSTAR (Nuclear Spectroscopic Telescope Array) mission. NuSTAR is a SMEX mission planned for launch in 2011. The Silicon Pore Optics is a European technology developed on the basis of commercially available silicon wafers from the semiconductor industry. This is novel technology for producing very light, stiff and modular X-ray optics that can be assembled into almost arbitrarily large apertures—and therefore are perfectly suited for IXO. As starting material, the Silicon Pore technology uses silicon wafers from the semiconductor industry. 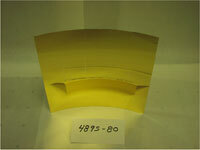 The wafers are then stacked into a pore structure with concentric cylindrical surfaces. Photographs credit of ESA, Cosine Research, Kayser-Threde, Micronit, SRON,NSI and MPE. M. Beijersbergen, M. J. Collon, R. Günther, R. Partapsing, M. Ackermann, M. Olde Riekerink, C. Cooper-Jensen, F. Christensen, M. Freyberg, M. Krumrey, M. Erhard, C. van Baren, K. Wallace, and M. Bavdaz. Silicon Pore Optics Technology. In American Astronomical Society Meeting Abstracts, volume 213 of American Astronomical Society Meeting Abstracts, pages 457.06, January 2009. E. J. Buis and G. Vacanti. X-ray tracing using Geant4. Nuclear Instruments and Methods in Physics Research A, 599:260–263, February 2009. G. Vacanti et al. A generic X-ray tracing toolbox in Geant4. In Proceedings of EUV and X-ray Optics: Synergy between Laboratory and Space Conference 7360, volume 7360. SPIE, 2009. Olde Riekerink, M. B.; Lansdorp, B.; de Vreede, L. J.; Blom, M. T.; van't Oever, R.; Ackermann, M. D.; Collon, M. J.; Wallace, K. & Bavdaz, M., Production of silicon mirror plates, Proc. of SPIE Vol. 7437 (2009). M. Bavdaz, Ph. Gondoin, K. Wallace, T. Oosterbroek, D. Lumb, D. Martin, P.Verhoeve, L. Puig, L. Torres Soto, A.N. Parmar, ‘IXO system studies and technology preparation’, Proc. of SPIE Vol. 7437 (2009). Kotska Wallace, Marcos Bavdaz, Philippe Gondoin, Maximilien J. Collon, Ramses Günther, Marcelo Ackermann, Marco W. Beijersbergen, Mark Olde Riekerink, Marko Blom, Bob Lansdorp, Lennart de Vreede, Silicon Pore Optics Development, Proc. of SPIE Vol. 7437 (2009). Maximilien J. Collon, Ramses Günther, Marcelo Ackermann, Rakesh Partapsing, Chris Kelly, Marco W. Beijersbergen, Marcos Bavdaz, Kotska Wallace, Mark Olde Riekerink, Peter Müller, Michael Krumrey, Stacking of Silicon Pore Optics for IXO, Proc. of SPIE Vol. 7437 (2009). Dirk Kampf, Markus Erhard, Marcos Bavdaz, Kotska Wallace, Philippe Gondoin, Maximilien J. Collon, Optical Bench Elements (Petals) for IXO, Proc. of SPIE Vol. 7437 (2009). Marcelo D. Ackermann, Maximilien J. Collon, Ramses Günther, Rakesh Partapsing, Giuseppe, Vacanti, Ernst-Jan Buis, Michael Krumrey, Peter Müller, Marco W. Beijersbergen, Marcos Bavdaz, Kotska Wallace, Performanceprediction and measurement of silicon pore optics, Proc. SPIE 7437, (2009).